PADI Instructor Pablo conducts the PADI Scuba Review for his clients from Australia! Home/News, Review & Refresh/PADI Instructor Pablo conducts the PADI Scuba Review for his clients from Australia! The PADI Scuba Review is an excellent program to refresh scuba diving skills for those certified divers who haven’t been scuba diving for a few months or years. Pablo, one of our full time experienced PADI Master Scuba Diver Trainers (MSDT) conducts the PADI Scuba Review program for two of his clients visiting our tropical waters of Borneo, all the way from Australia! Pablo will demonstrate a few choice skills to address buoyancy and useful emergency procedures, particularly the controlled emergency swimming ascent. His clients will remember these skills from their PADI Open Water Diver course and their earlier memories of scuba diving too! 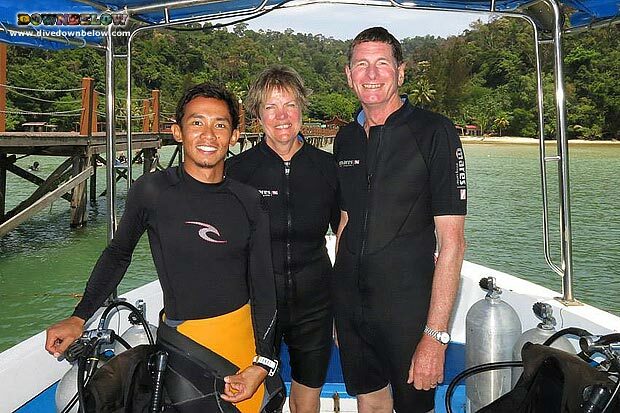 During their open water dive experiences within the Tunku Abdul Rahman Park, Pablo will supervise throughout and brief each dive so his students know what to expect and get excited! Contact one of our friendly and helpful Head Office staff to organise a schedule to refresh your scuba diving memories at our premier PADI 5 Star IDC beach house on Gaya Island! By Joanne Swann|2014-03-11T16:58:47+08:00March 11th, 2014|News, Review & Refresh|Comments Off on PADI Instructor Pablo conducts the PADI Scuba Review for his clients from Australia!